Been having a chat with our friends on the other side of the pond who are advising that there are good gains to be seen on the 125/130 E8* using the SuperSprint headers. They advise Evolve work hand in hand with SuperSprint so....! Can we use them over here? I know emissions etc may be a hold back. If so what sort of gains are there to be seen? And most importantly, do they clear the steering column over here? You beat me to it lol. Do they need cats further down too as I've read mixed reports. I know it will need cats to pass mot. I'm sure they were made for LHD cars. I know they could be adapted but it would be a shame to buy them and chop them up. Lol I could be wrong though I looked into these nearly two years ago. There is a bloke who made a set out of old m3 headers I believe if I find the email I got I will post it up here also check other forums as I'm sure some in South Africa have done this too. We can get SS to make some RHD headers for this car if there is enough demand. 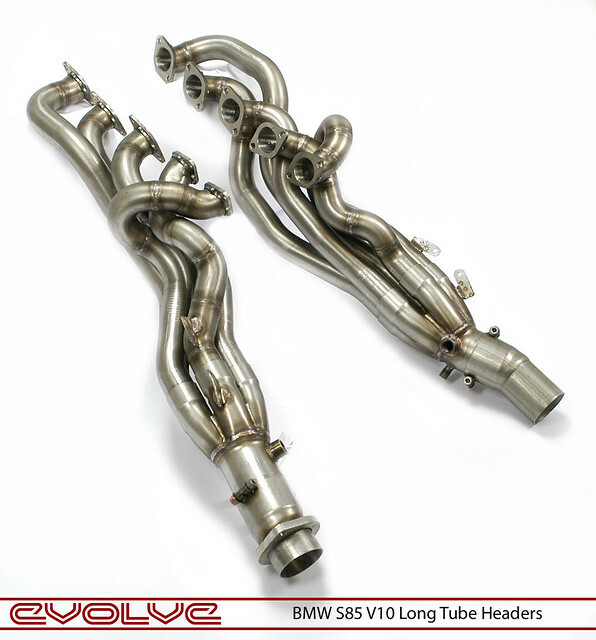 They already make our headers for E39 M5 and E60 M5/M6. One of Evolve's owners family members also owns a 125i which we developed our remap on so we even have a car to develop this on. We have discussed this before with SS and we believe one bank will fit and one will have to be redesigned to clear the steering column. Would need 10 customers to make this happen. Ben GT wrote: Any idea of the price? RRP is £1200 for the LHD so I would expect similar for the RHD version. If we had 10 committed buyers we could probably get this down to around £850 inc VAT as a group buy. The USA guys are getting around 20 BHP and 15-20 lb.ft torque so would expect around that much. We would test them on the 125i ourselves before releasing them anyway. I presume they will fit both the 125i and 130i? So should be pushing nearly 300bhp? Also, any information on this? "Read something interesting from Evolve on 1addicts saying the 125i couldn't make the same power as a 130i as they 'believed' the cat was more restrictive on the 125. That was nearly a year ago so would be interested to hear any updates you have on that too "
Ben GT wrote: I presume they will fit both the 125i and 130i? So should be pushing nearly 300bhp? Will fit both. 130i make around 255-260 stock on our dyno so 300 would be pushing it a little. We think there maybe a difference in exhausts but have not looked into it too much as the 130i/125i only makes up a tiny proportion of the cars that we tune. its nice and all that, but for me i don;t think the engine and power is the issue in a 130i, sort the suspension and diff and i think thats more than enough. if you want out and out power then i'd sell up and buy a 135i. I would also like to know on price, gains and any issues.